Kyle Hendricks has had issues all season with surrendering runs early. 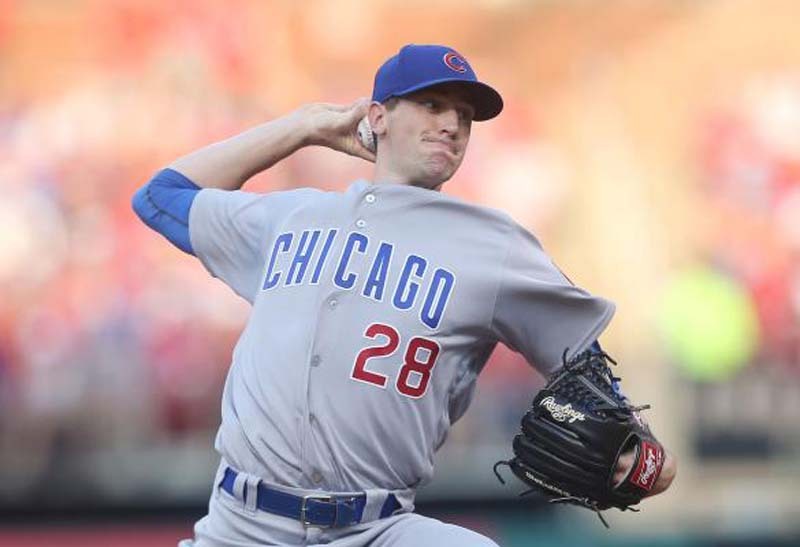 A day after Chicago Cubs starter Jose Quintana encountered the same problem in a 6-2 loss to the St. Louis Cardinals, Hendricks will look to help to avoid the Cubs being swept by their National League Central Division rivals. Marcell Ozuna clubbed a grand slam before Quintana -- who allowed six runs in the first inning on 51 pitches -- was able to register an out, which handed the Cardinals a series victory against the Cubs. Chicago will enter Sunday's prime-time series finale at Busch Stadium having lost five out of their past eight games. [post_ads]Now, Hendricks (6-9, 4.05 ERA) will attempt to get himself and the Cubs on track against the Cardinals. Hendricks has allowed 19 first-inning runs this season and has an ERA of 8.14 in the first frame, which has proven problematic all season. Hendricks has only one victory in his last seven starts and has not pitched more than five innings in three straight outings. He allowed three runs and seven hits while striking out eight over five innings in a loss to the Arizona Diamondbacks on Tuesday. Hendricks is 3-2 with a 3.58 ERA in 12 career starts against the Cardinals. In addition to battling inconsistency, Hendricks -- like the rest of the Cubs' starting pitching staff -- has struggled to pitch deep into games, which has put added weight on a Chicago bullpen that will add Tyler Chatwood in the coming days after the Cubs picked up starter Cole Hamels in a trade. Hamels is expected to make his Cubs debut Wednesday. "We're talking about (pitching deeper into games) with the whole staff, even the guys working behind the scenes to see if we're falling into tendencies, patterns," Hendricks said after his most recent start, according to the Chicago Tribune. "We have to figure out what to do to get bad contact. We have to do better in the 1-1 count. That's what I was trying to focus on. "But getting outs within three pitches, that has to be the focus. We're trying to get there. It's frustrating. It's a slower process than we hoped." The Cardinals' offense came alive for the second straight day and will look to keep rolling against Hendricks. St. Louis has scored 11 runs in the first two games of the series after the offensive potential that the Cardinals has shown all season has started to come together. And as the trade deadline approaches this week with the Cardinals shopping to add to its lineup of position players, interim manager Mike Shildt likes what his team has in place. "Whatever the moves (front office officials) make, they'll be supportive of, but I feel like we definitely have enough here," Shildt told reporters, according to MLB.com. "When you look at our team, look at our lineup, they're starting to be stretched out now. Guys are taking good at-bats. We're rolling the innings over, the lineup over. I think there's no question at all that we have enough offense to continue to move forward and push this thing." The Cardinals will send John Gant, (3-3, 3.44) to the mound Sunday. Gant allowed a pair of runs in an of relief in his last outing against the Cincinnati Reds and is 0-2 with a 1.93 ERA in a pair of career starts against the Cubs. Gant threw five scoreless innings against Chicago in his last start July 21.